Great product. Looks nice, feels nice, slides well under a table but it does not slide away from you when you put your feet on it. Nice storage. I had ordered one and really liked it, so I ordered another. VERY happy with these ottomans! 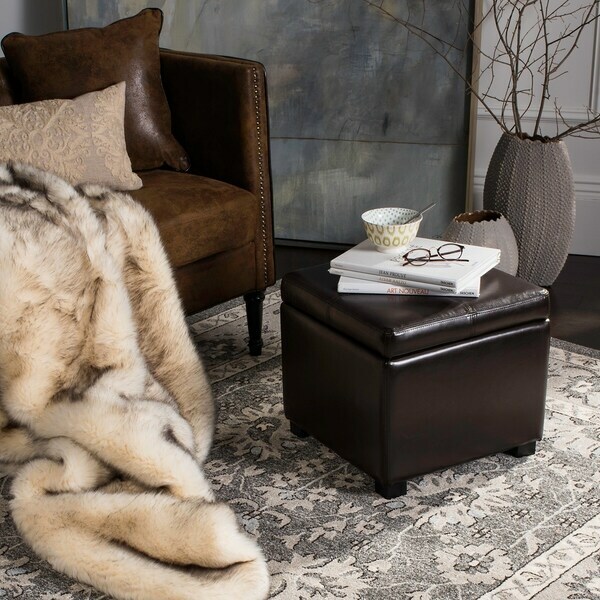 The Broadway storage ottoman will instantly be the star of the living room, family room or den. Crafted with sleek brown bicast leather upholstery and birchwood legs in a black finish, its hinged top conceals the hodgepodge of items that contribute to never-ending clutter, while its cushioned top offers extra seating for guests. The contemporary styling of the piece matches numerous decor styles, allowing you to continue using the ottoman when you update your furnishings and your home's decorative accent pieces. From media accessories to books and magazines, this piece stores items so that you can declutter your living area, and enjoy lounging in style. Dimensions 17 in. H. x 18 in. W. x 18 in. D.
The leather is not real. It’s flaking off. I like everything else about them. I bought two, but they are not furniture for the long haul. I have to replace mine now. 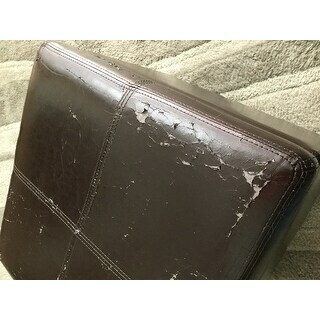 Would have paid more for real leather and not bonded or bicast. The Broadway Brown Leather Storage Ottoman this product is the best ever product that i have bought i'm so glad i decided to purchase this from overstock.com and not from somewhere else because of the price was higher at overstock.com but the quality is so much better than where i was going to purchase this from another store it was not as nice. i would buy from overstock again great quality products! Perfect color, matches the brown color i was looking for! Great for storage! Nice quality piece. Good storage space. Fully assembled. We love it! The color, leather and size are perfect for our small living room and there's storage! Perfect height to push up to a sofa for a foot rest or to sit on as an extra seat when needed. Comfortable, stable, good dark brown leather color (the red is a raspberry red).well crafted. I would recommend! This ottoman Is a good , reasonably priced addition to your family room or anywhere you may need one. It has a storage area and is well made. I’ve had this ottoman for a couple of years now and continue to use and enjoy it. It looks very nice and is useful for storage and as a seat. The leather has worn very well. I would recommend it. Holds several items that needed a home in our living room. Have had the ottoman over 2 years & still looks great! Nice for extra seating at holiday time! I purchased 2 of these leather ottomans for our basement where the kids hang out. These are the perfect height for resting your foot on and are very comfortable to sit on as well. They seem to be very sturdy and well built. the hinges are very durable. The color is a dark brown not blackish at all. have only had them 2 weeks so not sure about long term usage. I like to leather or manufactured leather. Would purchase this manufacturer again....overstock delivered it very quickly and in tack! Overstock does it again. 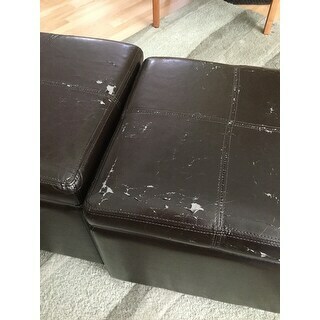 This leather ottoman is wonderful!! Looks fantastic and rich. I'd decided I needed two leather storage stools to place in front of the bookcase. It makes it convenient to sit and read, or stand on for reaching the higer shelves. The storage is a big bonus...I now have one full of CD's, and the other other full of DVDs, along with a couple of lap blankets!! I am very happy with this purchase. Another great buy from Overstock! Good price for two. However, the tops (lids) are hard and not as comfortable in comparison to my previous ottomans. The draw-back to “faux” leather is that the surface is so thin it WILL eventually start peeling. I know from experience. For this reason, buyers should plan on replacing every few years. Exactly as presented. Sturdy and has held up well. LOVE this ottoman! It matches the furniture in our family room beautifully. The stitching is very nice and the fabric is very attractive, and wipes clean with just a damp cloth. I highly recommend this ottoman! Ordered this as a Christmas gift. It arrived so fast, in time for Xmas and was perfect. It matches their couch and looks beautiful in their living room. Very sturdy and well made. Surprised at the quality and appearance for the price. The space to store extra pillows is very nice. I put this in my foyer. It is so small and cute. It holds some of my throws that I don't​ want to clutter the couch with. It comes set up so no extra work to be done. Very useful little piece. I use it in the hallway, to seat while putting shoes on, or to put my purse on it. Leather is soft, and the color is warm brown. It's rather light and easy to move around. I haven't used the storage yet. Bicast describes the grade of the leather. "What is the weight capacity for sitting on the ottoman?" The weight capacity is approximately 275 lbs. The perfect size and color! To replace a pair purchased on Overstock 10 years ago. "what are the storage dimensions?" Hello eitzenkind, we appreciate your inquiry. The inside storage dimensions are 14.6 x 14.6 x 10 (inches). We hope this information has been helpful. Thank you for shopping with us. Have a great day! Hello robyn99, we appreciate your inquiry. The shipping weight on this item is 20 lbs. We hope you have found this information helpful. Thank you for shopping with us. Have great day!